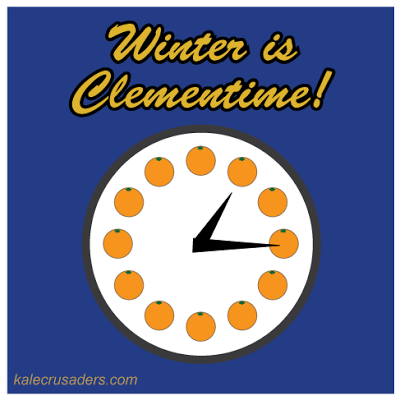 What do you get when regular old Wheat and Freekeh (a.k.a. Green Wheat) switch places for a Friday and learn a tender lesson at the end of the day? Freaky Friday might have gone through many remakes, but none like this. 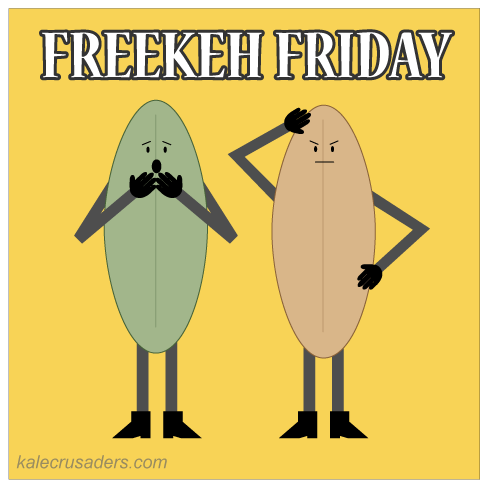 Among the crazy fish-out-of-water scenarios, Freekeh finds himself in delicious dishes, including kabocha squash stuffed with roasted green wheat and peppers, freekeh tabbouleh, freekeh with mixed vegetables, and freekeh breakfast pudding. Happy Friday! 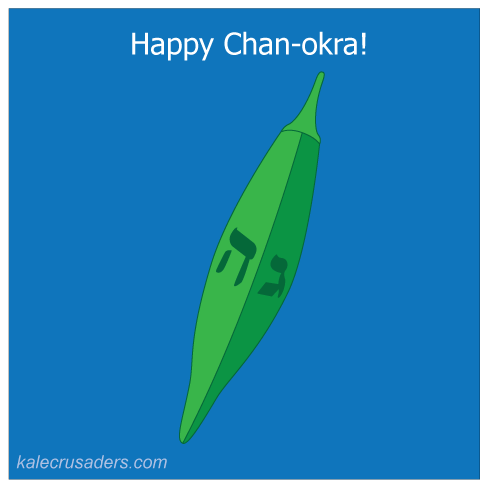 Happy Chanukah! What's not to love about a holiday that involves fried food (latkes), spinning tops (dreidels), and playing with fire (lighting candles)? Please don't light Okra on fire (although roasted okra is pretty tasty), since he lends himself to both spinning and frying (okra fritters are kind of like okra latkes). If you are looking for something a little less fried, check out pickled okra, sweet and sour okra, or quick stir-fried okra with fresh tomatoes and turmeric. Happy eating! After a great deal of back and forth, a few tears, and finally a lot of hugging it out, we are proud to announce Rambutan and Ghost Pepper as the Halloween Costume Parade winners! When Rambutan heard the news, he could not believe that he would have to share his title with Ghost Pepper and demanded a recount. While recounting set us back a bit (we promise that's why it took us so long to announce the winners! ), we hope printing T-shirts will take less time. 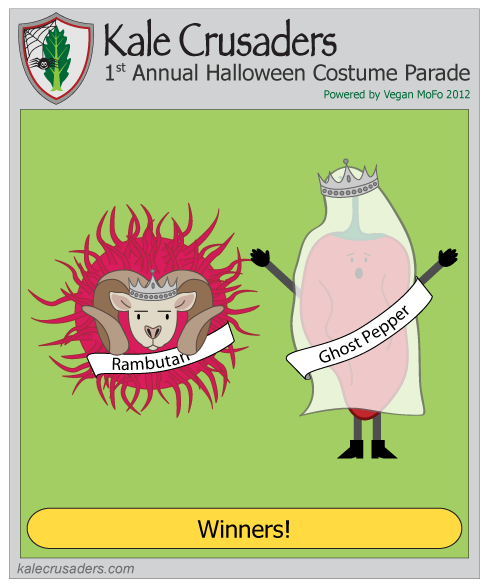 Lest we forget our favorite fans, both Rambutan and Ghost Pepper each selected a reader to win a free T-shirt. The winners are e (@sirrice) and drMikey! 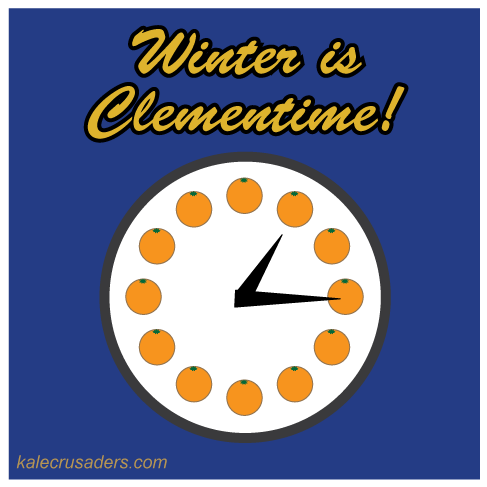 Please email us at info@kalecrusaders.com with your mailing address and T-shirt size!